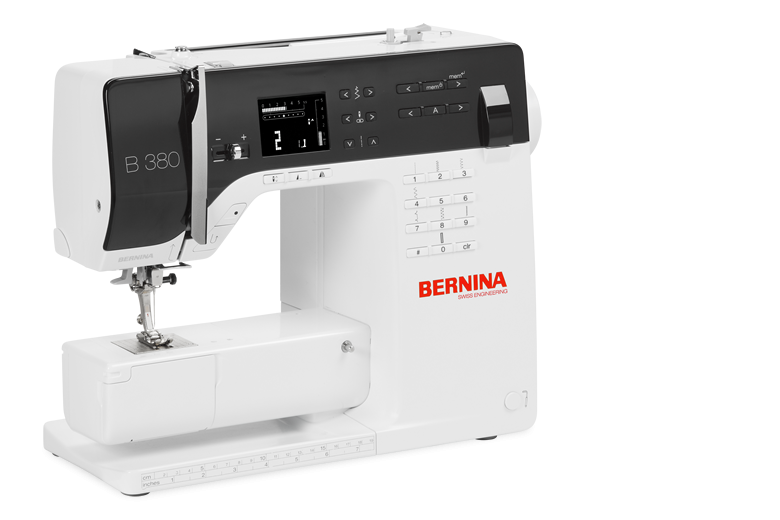 At the top of the 3 Series line, the BERNINA 380 truly shines with its unique look and counteless features. A modern, bright LCD display lets you keep track of the functions you’ve set at all times. Direct-selection keys allow for quick and easy operation. The start/stop button, speed control, semi-automatic threader, automatic buttonhole and fast stitch-selection functions save time and enable precise sewing and patchworking. The bright LED sewing light, extension table and free-hand system increase sewing ease. Stylish sewing really can be this simple! Your machine will also travel with you . . . in style . . . with the included tote. Stitch Length / Stitch Width: Simply press the keys to change the basic settings. All settings are clearly displayed on the screen. Direct Stitch Selection: The most common utility stitches and functions are right at your fingertips—quick and practical. Automatic Buttonhole: Beautiful, repeated buttonholes with the push of a button! Quick Reverse Button: Temporary or permanent sewing in reverse is now fast and easy. Start / Stop Button: An alternative to the traditional foot control, ideal for those with special needs or those who simply want options. Thread Tension: Upper tension easily adjusts for specialty threads or techniques. Two Spool Holders: For double or triple needle stitching, the integrated spool holders provide a built-in location for easy positioning of thread spools. Thread Cutter: Save time when threading, winding bobbins and at the end of seams. Have more time to sew! LED Sewing Light: The extra-bright LED light provides optimum illumination of your work area. FHS Functionality: The time-saving Free Hand System raises and lowers the presser foot for hands-free convenience. Extension Table: Simple and smart, the extension table makes sewing easier by providing the added comfort and convenience of a larger sewing area. Accessory Box: Keep the accessories included with your BERNINA 380 organized. There’s even space to add optional presser feet to expand your creativity.